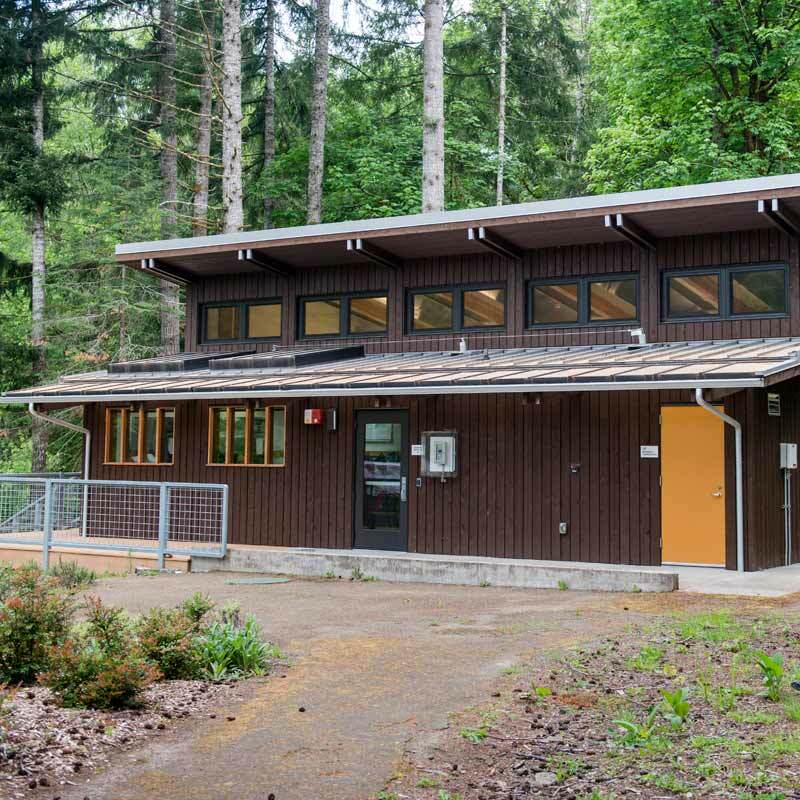 Evergreen’s Sustainable Agriculture Laboratory (SAL) is a space for developing a scientific, cultural, and sensory understanding of our food systems. The facility is equipped for hands-on cooking and lab activities, value-added food production, lectures, and social gatherings. Students in the program Terroir listen to a talk by expert Susan Knilans about wild honey bees. In academic programs, students not only prepare food, but also analyze variables that affect flavor, texture, and appearance. They also examine agricultural factors such as soils, plants, fungi, and insects. Students working and studying on the adjacent Organic Farm process their harvest, producing items like salad mixes, fruit preserves, kimchi, and pesto. These value-added products can then be sold at the on-campus farmstand. If you are doing independent study around food systems, you may also be able to work in the laboratory as part of your studies. Learn more about academic uses of the Sustainable Agriculture Lab. 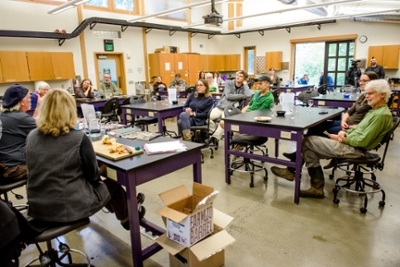 Nancy and Steve "Bear" Bishop of Alpenfire Cider host a Cider Appreciation Workshop in the Sustainable Agriculture Lab. The Sustainable Agriculture Lab is also a venue for student groups with an agricultural or food systems focus. 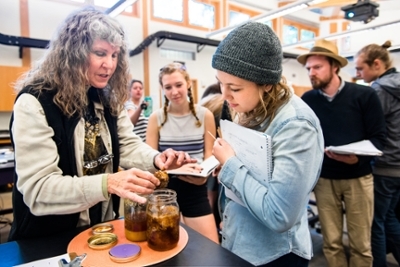 Campus and community events held there include the Harvest Festival, Return to Evergreen, and workshops on cider-pressing and permaculture. The building itself was sited to protect solar access for existing gardens. It was built with high-efficiency practices to reduce energy use. FSC certified wood products are used throughout. Landscaping features native and edible plants, and permeable surfacing for driving and parking areas. Covered bike storage was included to encourage alternative transportation. The light fixtures are shielded to reduce light pollution and protect night-time sky. Recycling and compost stations decrease the waste contributions of the facility. Future potential improvements may include radiators supplied by solar water heating, greywater re-use, rainwater harvesting system, compost heat recovery, or a photovoltaic power system. Contact us if you are interested in making any of these upgrades a reality. Faculty, students, and staff can reserve time in the lab and kitchen for academic projects and other college business.